Siebel has so many built in functionalities, it is hard to find in any other CRM (On Premise/Cloud). Have you seen customized home page in Siebel, mainly in Partner Portal application? 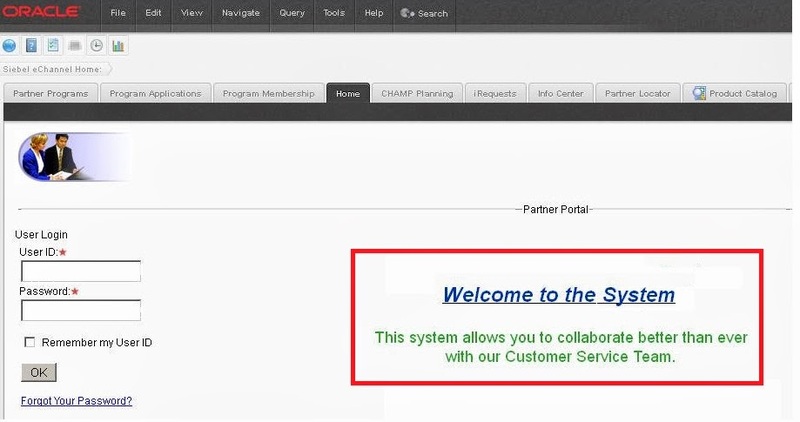 Here is the screenshot what we have customized for Siebel Partner Portal Home Page. Is it difficult to configure!! To meet such requirement, we have to modify HTML script which is responsible to build user interface. In any CRM, except Siebel or Open UI, first we have to find out the HTML/CSS file which is responsible to display message on Home page, then change HTML script, test it. If anything is not in proper place, then again modify the template and test it. Lot of work, isn’t!! Now see, how easily we can meet such requirement in Siebel or Open UI. In Siebel, customized home page is derived from Microsite. Siebel provides specialized business component ‘ERM Microsite Section Body VBC’ to display data from Microsite. Throughout this article, we will use Partner Portal Home page to describe configuration steps. So our applet name is ‘ePortal Cat Splash Applet’ which is based upon ‘ERM Microsite Section Body VBC’ business component and view is ‘Home Page View (SCW)’. This is two step configuration. First configure Microsite VBC in Siebel Tools and then Administration-Microsite in Siebel Client. – Go to Administration-Content Center > Content Sets and add new content. If you have the content file ready, then upload it by clicking on ‘Add Content’ button otherwise create new content. give the content name and title. .HTML extension. We will modify it once the file is uploaded. properties as well, like Language Code, Private, Data Length. We could leave these as it is. For partner portal home page, we have used below specification. name used in Siebel tools. That’s all, Open the eChannel application and verify siebel partner portal home page. See how we can build our custom home page without any HTML script! Siebel is fun, Isn’t it!! If you have any doubt or question, feel free to comment here. To get more updates on recent activities, follow ‘TechOneStop‘ on Facebook/Twitter/LinkedIn or join our website as followers. We love to stay connected. Do you join us? What would you say if I tell you that all training courses are 95% cheaper (by Udemy)?